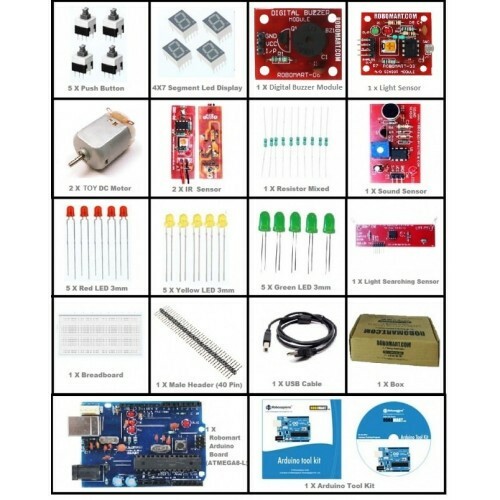 The Arduino Quick Learning Kit by Robomart is a combo of electronic items which is designed to achieve the goal of providing quick, easy and also cheap startup with Arduino embedded system. Now a day’s Arduino is a well known entity in the field of embedded system and robotics. It will provide you to interact will hardware and software in more expressive way. It is used in Arduino based projects. School projects and college projects. 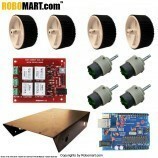 1 X Robomart Arduino Atmega8 Board. 2 X IR Based Digital Color Sensor(Black/white). 1 X Light Searching Sensor. 1 X Digital Buzzer Module. 1 X Red LED 3mm (Pack of 5). 1 X Yellow LED 3 mm (Pack of 5). 1 X Green LED 3mm (Pack of 5). 1 X Push ON OFF switch (Pack of 5). 1 X 40 Pin Male Header. 1 X 7 Segment Led Display. 1 X Toy DC Motor. 1 X Resistor Mixed (1K * 5)(5K * 5)(10K * 5). 1 X Arduino Tool Kit. 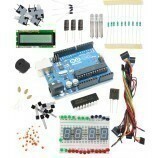 Also Searched as : Arduino Quick Learning Kit.